The word “episcopal” refers to governance by bishops. The historic episcopate (bishops) continues the work of the first apostles in the Church: guarding the faith, unity and discipline of the Church, and ordaining men and women to continue Christ’s ministry. 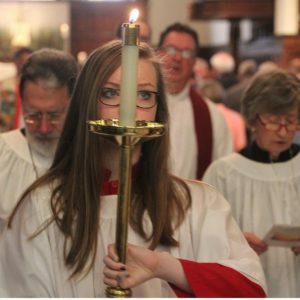 An Episcopalian is a person who belongs to The Episcopal Church, which encompasses churches in the United States and 16 countries. The Episcopal Church is part of the worldwide Anglican Communion. the sacraments of the church were given by Christ. At most worship services we share the sacrament of Holy Eucharist (communion). The Episcopal Church follows the “via media” or middle way in our theology and discussions because we believe that, whether or not we agree on a particular topic, we all are beloved by God and can have thoughtful and respectful discussions. 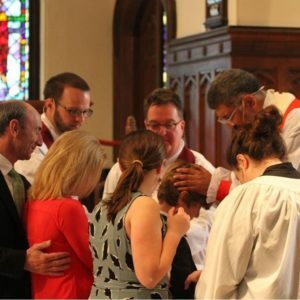 There are no prerequisites in the Episcopal Church … everyone is welcome. We are bound together by our love of God in Christ Jesus, by our shared traditions, and experiences of God in the worship and the life of the community. That is not to say that Episcopalians don’t believe specific or particular things. It is just that each member of our community is able to think for herself or himself, to wrestle with doubt and the questions of faith, and to arrive at conclusions which may be different than those of other members within the community. We strive to be open, affirming, and welcoming. We are all church together. Our church as an organization – from the national governing structure all the way to the individual parish – is run by lay people and clergy working together, making decisions together, in an open and democratic process. We have no high council, no infallible leaders, and no elite ruling class. We’re all in this together. Our faith is a living faith, and our church is a community, not an idea. The only way to know what Episcopalians believe is to come and see for yourself. We invite you to worship with us, pray with us, and sing with us at the table of the Lord.